By Herb Lutz, Global Principal Consultant, Manufacturing Sciences & Technology, MilliporeSigma. Next generation manufacturing covers a collection of technologies aimed at improving productivity, i.e., getting higher throughput and/or better quality out of a process. Single-pass tangential flow filtration is widely used in other industries but has only recently been considered for bioprocessing. By inserting an in-line tangential flow filter before a given bioprocess step, we can significantly concentrate the input for that step and, in many cases, also improve its productivity. We routinely see concentrations increased by factors of two to three-fold using this method. In fact, I have achieved 30-fold concentration factors like this, but admittedly it’s not easy. 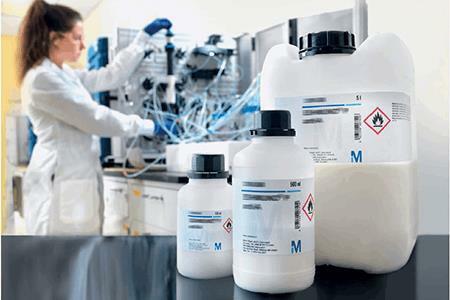 There are a number of advantages associated with a more concentrated bioprocess input. One is the ability to shrink the footprint of a process. For example, Genentech published on a case where they wanted to introduce a new molecule for manufacture at one of their plants and found that the necessary process would not fit in the tanks they had on site (1). By employing a single-pass filter, they shrank the volume sufficiently to fit their existing infrastructure – far more cost-effective than spending hundreds of millions of dollars on another manufacturing plant! Similarly, another case used a single-pass filtration system to debottleneck a large stainless steel, European facility. Inserting a SPTFF step to increase product concentration can also improve a subsequent step, such as polishing. In a typical manufacturing process, polishing is the third chromatography step, and tends to be a flow-through ion exchange step intended to remove viruses and host cell proteins from the antibody product. The mechanism relies on running the system at pH 7-8 (i.e., at a pH below the isoelectric point of the antibody and above the isoelectric points of contaminants). It turns out that pre-concentrating the input fluid increases the polishing efficiency due to a characteristic of the equilibrium isotherm in adsorption chromatography; basically, at higher host cell protein concentrations, proportionally more of these impurities will bind to the resin. By using SPTFF to pre-concentrate not only the antibody but also the host cell protein, we improve the efficiency of the process by a factor of four or more. People often get excited about a new resin giving a 15 or 20 percent increase in capacity, but adding a SPTFF step gives a 400 percent improvement! And there’s more – given that we shrink the volume of liquid as we concentrate it, we can run the process more quickly. In this way, manufacturers can run more process cycles in the same time and actually get a five-fold productivity improvement from running a filter in SPTFF mode of operation before the polishing step. A further advantage of single-pass filtration relates to problems associated with the high salt concentrations remaining after eluting from the cation exchange purification step upstream of the polishing step. Normally, these salts interfere with protein binding in the quaternary amine polishing column, and thus reduce clearances of viruses and host cell proteins. Manufacturers often try to get around this by diluting the feed to reduce the salt concentration, but this volume expansion has the unwelcome effect of dramatically increasing column sizing and process time. With SPTFF, you both concentrate the proteins and eliminate the salts, meaning you can enhance protein binding without the inefficiencies of a diluted input. Similarly, for those processes associated with species of host cell proteins that are very difficult to eliminate by normal processes, the concentration and desalting associated with a single-pass filtration application can be very helpful and provide better product purity. And improved product quality always goes down well with regulators. At MilliporeSigma, we are combining these advances into new systems for new applications. For example, we are running our strong anion exchanger in-line with our TFF cassettes, and have devised procedures for assessing the feasibility of these systems with various molecules (2-4). We have also demonstrated excellent virus clearance with concentrated feed and high loadings, and worked on scaling up these systems, and on implementing them as part of a continuous manufacturing process. 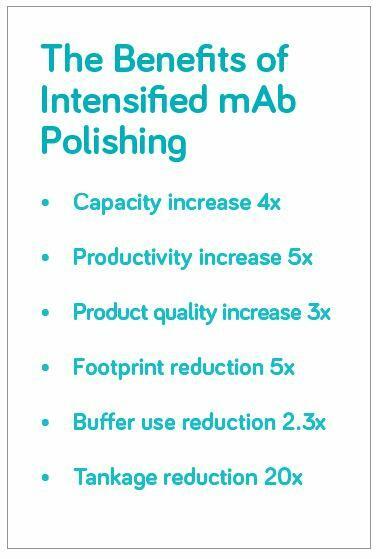 It’s also worth noting that intensified polishing is flexible so that it can be used either continuously or as part of a batch process. The addition of in-line SPTFF does not significantly increase complexity but rather is easy to use like an in-line prefilter. Our new gamma irradiated UF capsule is ideal as it does not require holder compression or extensive pre-flushing. Because our intensification processes provide significant economies, we’ve had much interest from pharma companies seeking a competitive edge. Biosimilars companies are particularly intrigued, as their cost-competitive model puts them under immense pressure to shrink the manufacturing process. That said, manufacturing space is tight for any company, so when we say that we can shrink the process by a factor of five, we tend to get people’s attention. We are now in the process of setting up collaborations with clients to demonstrate the levels of savings they can achieve through implementing our approach. 1. CA Teske et al., “Inline Ultrafiltration”, Biotechnol. Prog., 26, 1068-1072 (2010). 2. MilliporeSigma, Application Note, AN5364EN00 Ver 1.0, “Intensified Polishing Using Single-Pass Tangential Flow Filtration (SPTFF) with Anion Exchange Chromatography” (2017). 3. MilliporeSigma, Poster, PS1282EN00 Ver 1.0, “Intensified mAb Polishing: Linking Single-Pass Tangential Flow Filtration with Anion Exchange Chromatography” (2017).